DENSO Group Germany, leading manufacturer of corrosion prevention systems for welded joints, pipe rehabilitation and pipe coatings, expands its comprehensive product range with new PALIMEX® protective tapes for pipes and station construction. The new co-extruded PALIMEX tapes – which are ideal for use on buried steel and cast iron pipes – provide long-lasting, high-strength protection, whether they are used individually or combined as a tape system. The protective tapes reliably absorb the high mechanical loads that occur in these applications. The flexible modular structure of the tapes means that varying tape dimension and thickness can be combined as needed. 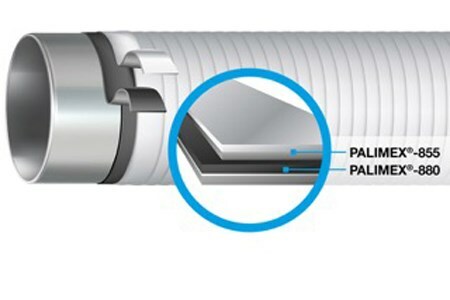 PALIMEX tapes provide excellent electrical insulation for a wide range of building projects: On straight pipe sections, the tapes are easy and cost-effective to apply, and on components with different geometries – such as pipe bends and moulded parts – they are flexible and adhere perfectly to the pipe. With this new addition to its range, DENSO is offering a permanent protection solution for pipes designed for operating temperatures of up to 85°C. Applied directly to the pipe surface requiring protection, PALIMEX-880 forms a strong and impact-resistant pipe coating. The UV-resistant PALIMEX-855 is diffusion-resistant against external factors such as water vapour and oxygen. The tapes are resistant to corrosive media, either on their own or as part of a system solution comprised of both types of tape.